Are you sick and tired of locked-in or locked-out issues? Do you want to finally put an end to your problems? If you just said yes to these questions, we are the best local locksmith services provider that you can count on. Whether you are in need of quality residential, commercial or automotive locksmith services, rekey locks Sand Diego is your most reliable partner when it comes to any kinds of lock rekeying needs. Any time of the day, fell free to contact us and we will come to your rescue. It is very essential to keep your valuable things in good condition that is why you need a lock or rekeying to ensure total security of your vehicle, home, office, or business establishment. However, once you misplaced, lost or forgot your key inside your house or car, it can bring you to a frustrating situation. You need a spare key and in that case, this is the part where you will need the help of rekey Sand Diego. Since you are looking for the most dependable service provide, trust our expertise and you will be in good hands. Hundreds of thousands of customers throughout California and other regions in the United States have proven our unrivalled excellence in lock-rekeying and other related works. Rekeying means you having to adjust the tumblers in a current lock, so that, only the new keys will be able to open it. Lots of people, who are continuously using the same key they received when they have bought their home do not an idea about how many people (including neighbors, friends, tradesmen, and many more), who not relevant anymore, have access to that certain key. Most technicians are able to re-key your locks, giving you the security to know that only you and the people whom you trust can have access to your domain. Furthermore, rekeying can adapt your current locks to new keys. 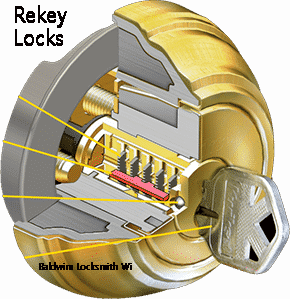 Rekey San Diego replaces upgrades and installs locksets; deadbolt locks, and locks cylinders. On the other hand, master keying allows 2 distinct and different keys to open lock. Master keying will regulate access to particular zones, while having one master key accessing all the zones. Master keys may be supplied for all building like office buildings, hospitals, and residences wherein there are a number of compatible locks. It is now possible to rekey your gate, home, garden shed, and more, so that one key will be able to open them all. If these are among your needs you do not have to worry anymore. Our rekey lock professionals have all the solutions for your problems. You do not need to hire another service provider for these two different needs because we can do it all for you. We know how to do things in the most effective ways possible. Rekey lock Sand Diego experts will look for obstructions in the in the door and at the threshold jammed. Our lock system specialists will also check the frame and door for warps and twists. We ensure that doors are completely rested against the doorstop and stay there to function smoothly. If the door would rest at the stop at the bottom or top, we will twist the frame or door to avoid further damages. If your door is springing open, the hinges may possibly be binding. Furthermore, if you have weather strip in your door, it may obstruct the path of your door. Our professionals know that wooden frames and doors will swell and warp with humidity and temperature, and metal frames and doors will be rusting and twisting through time. We will do all the difficult tasks for you. Our expert team fully understands that security is very important. For this reason, rekey lock San Diego always makes sure that maximum security is fully maintained by your property day –in and day-out. Being locked in your house or car gives an alarming situation so we are readily available to help you out. Regardless of your location, we make sure that we’ll be there in no time. Since we have been in the industry for many years, we are already adept to every region. For many years, people have made the right choice to count on the most effective yet cheapest services that we offer including car key replacement, rekey, ignition repair and may other locksmith services. We are driven by the mission to provide total quality of workmanship and hasty services. Surely, you can have peace of mind once you hire locksmith in this area. To validate our services, rekey lock San Diego only use the most innovative tools and equipment necessary to be the top service provider in the industry. In addition to that, we also assure you that our workers have high set of skills and experience. In this way, rest assured that you’re safety is in good hands. If you are looking for reliability, price and professionalism, we should be the best one in your list. Rekey Locks San Diego is a one stop solution for residential, commercial and automotive locksmith services. When you have any lock and key problems, don’t hesitate to call us and count on our undisputed expertise. Since we offer 24/7 services, you can acquire our quality service and reach the utmost customer level of satisfaction any time. Don’t let your damaged lock bother you, give an immediate necessary action with locksmith services and we will give you the best work that you truly deserve. Are you dealing with lock in or lockout services? If so, you should never settle for less. You have to keep in mind that choosing an unreliable service provide when it comes to locksmith services could just bring you headache. As such, it is always very important to work with a highly qualified locksmith service provider in order to come up with the highest quality of services. Call rekey lock San Diego or visit their website and find out how our expert rekey lock technicians can help solve your problems. With us, locksmith problem is only a call away!